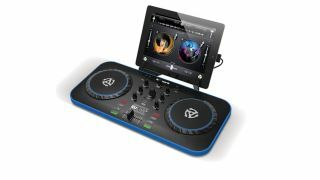 NAMM 2013 PRESS RELEASE: Cumberland, R.I. (January 24, 2013) - Numark, the world's leading manufacturer of DJ technology, announces iDJ Live II, a new mobile DJ controller that offers versatile control over a wide variety of computer-based and mobile DJ platforms. An updated and enhanced version of Numark's iDJ Live controller, iDJ Live II features an updated low-profile design and USB connectivity, allowing it to perform with both laptop-based and mobile DJ platforms. iDJ Live II features a standard layout of DJ controls, including a crossfader, EQ knobs, and capacitive touch-activated platters. The design of iDJ Live II has also been slimmed down with redesigned platters that are now illuminated and low- profile. A headphone/speaker splitter cable is also included. "iDJ Live II enhances and builds upon our original vision for iDJ Live - give anyone and everyone real DJing capability in a compact, comprehensive, and fun package," said Chris Roman, Numark Product Manager. Numark will display and demo iDJ Live II at Booth 6700 at the 2013 NAMM show.